Description: Gloob Rescue was developed under National Science Center (NSF) funding by Design Interactive, in partnership with cerebral palsy experts at the Conductive Education Center of Orlando (CECO), Florida Institute of Technology (FIT), and Blue Orb. Gloob Rescue was developed to assist children with cerebral palsy (CP) as a rehabilitation focused game to expand upper limb strength, range of motion, and rehabilitation progress. Gloob Rescue integrates with a Microsoft Kinect v2 to track user motion and drive individualized training progression. In the game, Gloob characters have fallen into a pit of goo and need to be freed. Users move their hands over the Gloobs for an adjustable period of time (0.5 – 5 seconds), to free them. Users are given an adjustable period of time, based on their training progression (00:00 – 59:59 minutes), to rescue the Gloobs. 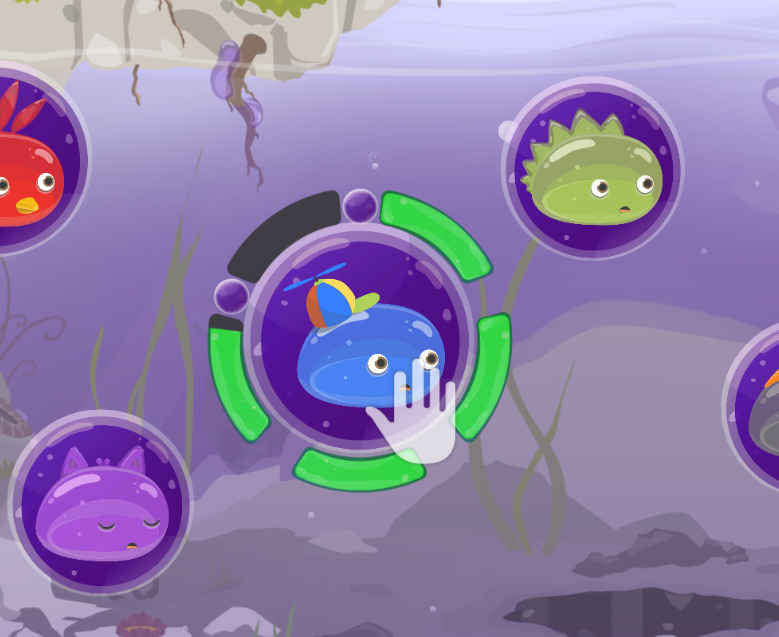 The game ends when a user has rescued all 8 Gloobs, or the time has expired. Gloob placement and hover duration incrementally increase to drive training progression, associated with improved upper limb function and range of motion. Skills and Ideas Taught: The skills of upper limb reaching, extension, and endurance (holding limb in place) are taught in this game. Goal or Challenge: The goal of the game is for the user to save all the Gloobs in the predetermined period of time by holding their hand over them for an adjustable period of time (0.5 – 5 seconds). Primary Audience: The primary audience for the game is children (K-6) with limited range of motion of their upper extremities (arms, elbow, shoulder). Assessment Approach: Score is accumulated by number of Gloobs saved. Additionally, skill progression can be measured by decreasing the time provided to save all 8 Gloobs, and increasing the ‘hold’ time. Finally, joint angles and limb positions are captured by the Kinect and determine the user training progression in terms of increased mobility, strength, and range of motion.